Dad will love this cool hanging sign and hang it proudly for all to see in his office, shed or his Man Cave. The First Edition Man Made paper is perfect for Dads who loves transport, architecture and travel. 1. To cover the whole of your A4 grey board, cut a piece of pastel green textured card stock to 29.7cm x 21cm and stick down using double sided tape. 2. With your chosen paper from the First Edition Man Made paper pad, cut it to 29cm x 20.3cm and stick to the centre of the green textured paper. We have used the fun mini cooper paper for our sign. 3. Cut another piece of textured card to 20.5cm x 18.2cm and stick to the centre of the board. Pick another patterned paper from the First Edition paper pad and cut to 20.1cm x 17.7cm. Using double sided tape, stick the paper on top of the textured card to create a border. 4. Cut another piece of textured card stock to 20 cm x 9.9cm and layer with a different patterned paper. Stick this to the bottom of your centrepiece. 5. 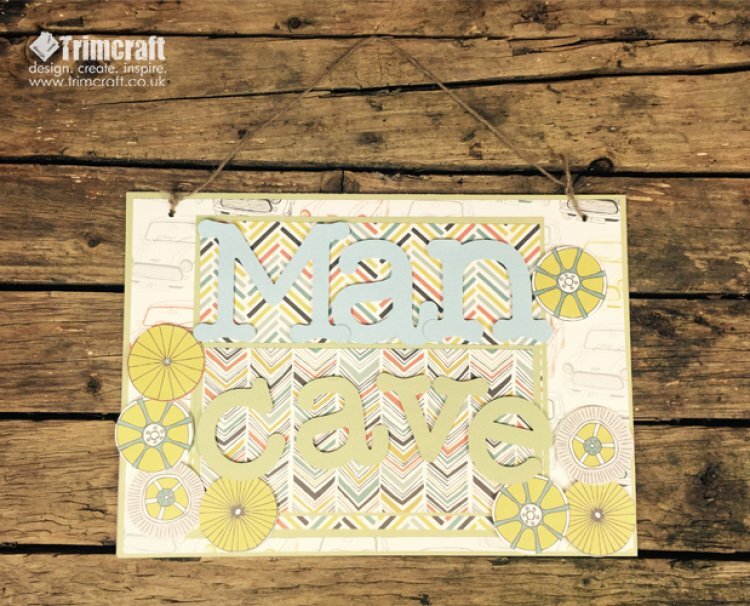 In the Cricut Design Space, type the words ‘MAN CAVE’, we have used the Cricut Alphabet font which is the automatically set typeface on the software. There are plenty of fonts to pick from in the design space or you can create your own. Using the Cricut Explore Machine, cut out the word with textured paper, we used blue and green card to compliment the sign’s colour scheme. Add depth to the text by sticking to the board with foam pads. TIP: If you don’t have a Cricut machine, why not use alphabet stickers to write your text. 6. Use the Fiskars circle squeeze punch to cut out some of the bike wheels from the First Edition Man Made paper pad. Use foam pads to stick them around the bottom of the sign and text. 7. Punch two holes in the top of the sign with a hole punch and feed the jute string through so it can be displayed wherever your Dad chooses. We have also made this Dad’s Den hanging sign. Simply cut another piece of A4 grey board to 29.6cm x 11.9cm and create a point by cutting one side by cutting diagonally by 10cm on both sides. Cover your arrow sign with First Edition Textured paper. We have then cut the colourful townhouse paper to 20.2cm x 10cm and cutting the sides diagonally by 8cm. Stick to the centre of your textured card to create the background for the ‘Dad’s Den’ text. The great thing about these handmade signs is that you can also make and give them to male relatives; they will love them! Have you handmade your Father’s Day gift? We would love to see what you have made for your Dad in the project gallery.